Guisado means stew in Spanish and that's what we're doing here: onions, garlic and tomatoes are slowly cooked before adding corn and lastly squash and cheese resulting in an incredibly tasty broth, squash that still holds its texture while cheese, much like Indian paneer, adds creamy goodness. There is something so incredibly comforting about food and the memories they conjure from seemingly no where. A simple food. A sweet smell. A pungent aroma. A spicy tickle on the nose. Then bam! The floodgates burst open and you're remembering conversations long forgotten. Ghosts flit around you, enveloping you with their ethereal limbs, reaching down deep to touch your heart. That's what this dish does to me. 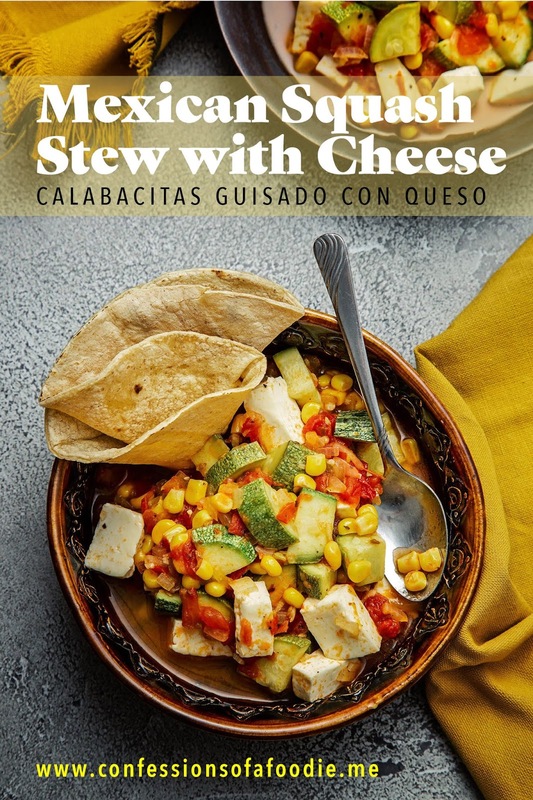 This calabacitas guisado con queso incorporates the classic flavors from my childhood like my father's short ribs stewed with everything in today's squash dish minus the cheese and corn and the addition of cilantro. One whiff of the stew as I gently lifted the lid of the cazuela (clay pot) to check on the doneness of the tomatoes and memories of watching my father whack pork ribs down with his ginormous meat cleaver, cutting them into thirds so they're practically bite-sized, filled my head. 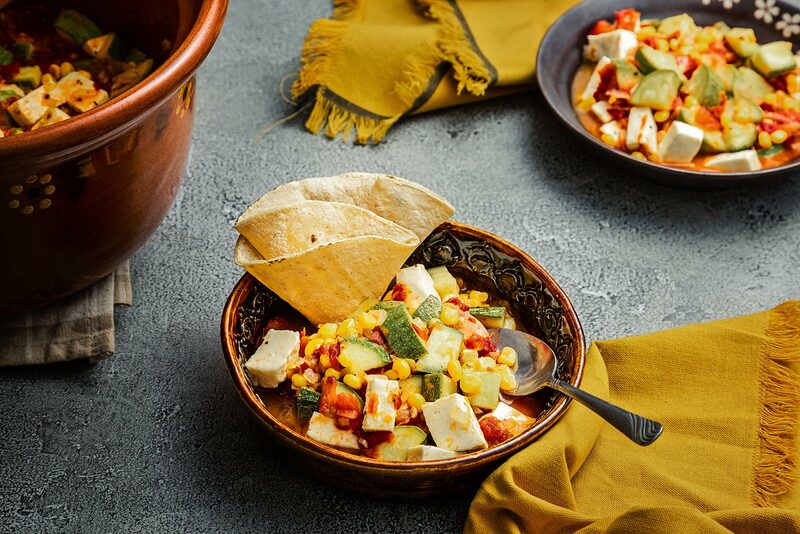 More recent memories of the past few years living with my grandmother and her version of this traditional Mexican recipe also intertwined themselves with my childhood memories. 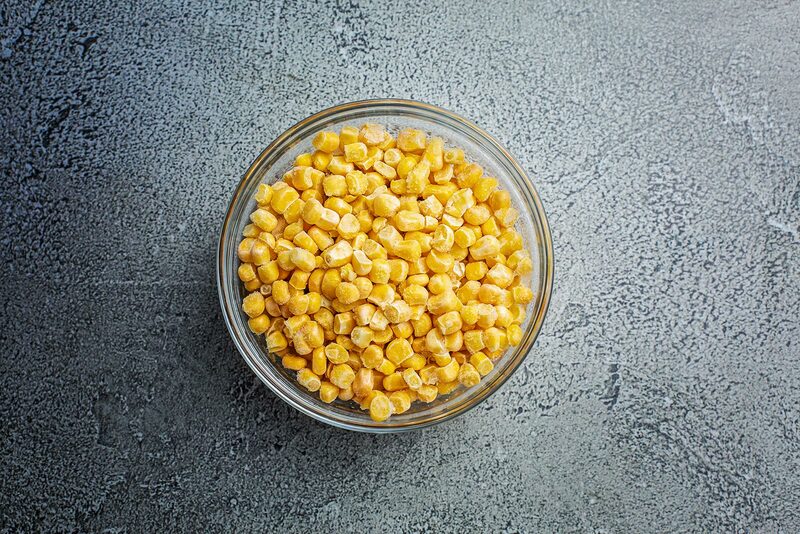 Grandma would often make hers with her beloved Pace Picante Sauce instead of stewing tomatoes from scratch and replacing the corn for garbanzo beans, one of her favorite sources of protein. 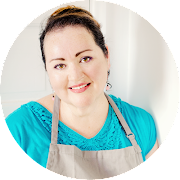 Each preparation – though incorporating the same basic ingredients, the same basic cooking methods – produce two different dishes with flavor profiles different enough so one can't be confused for the other. 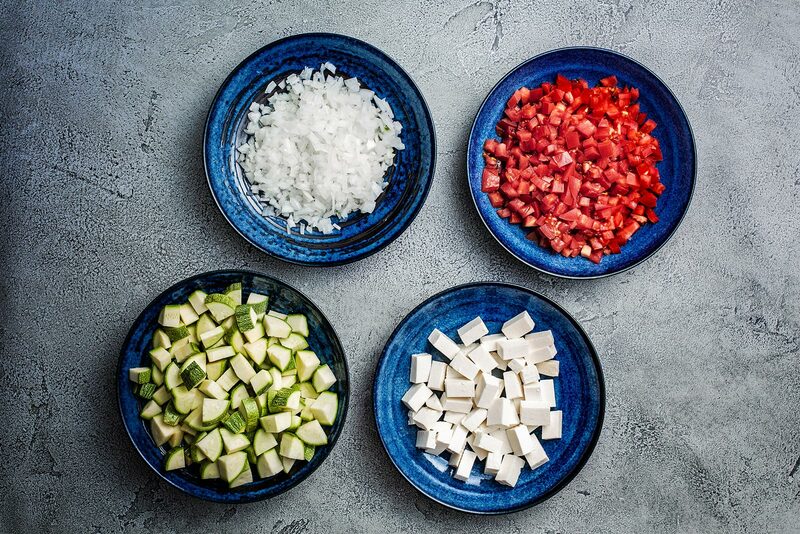 That's the beauty of Mexican cooking for me: Once you learn basic techniques, basic flavor profiles, you can play with them, modifying them to your personal tastes and creating dishes that are uniquely yours but still rooted in tradition. 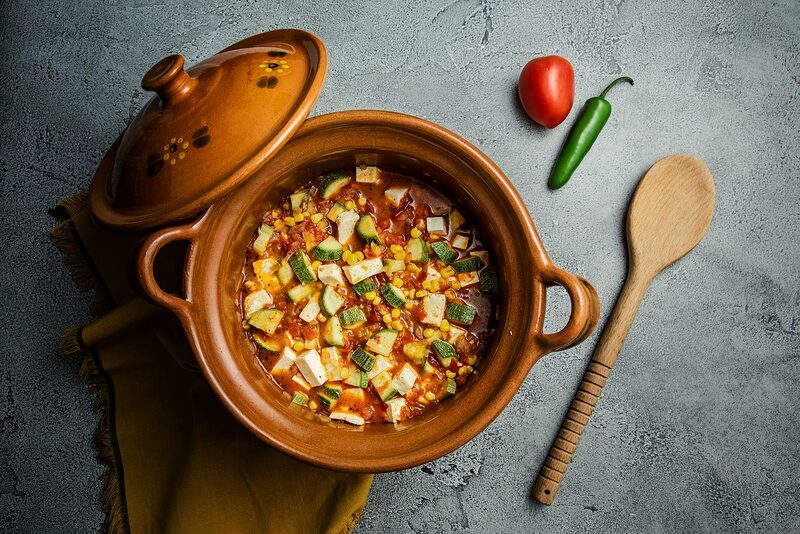 This stewed squash with cheese is a simple, humble dish popular in many Mexican homes, each family adding their own little variations. Hearty enough to be a meal in itself during the lenten season or, served in smaller portions, a good accompaniment to roast chicken, pork loin or even steak. Personally, I served it with my vegan mushroom in green mole tamales (recipe coming next week!) and they were a perfect match. The two together have been a satisfying breakfast all week. When a recipe is as simple as this one is, with limited, basic ingredients, the key to success is technique and time. Meaning, everything is uniformly cut (technique) and the cooking is unhurried with the ingredients added at just the right moment (time). The star ingredient is the calabaza or squash in English. In this case, the oblong-shaped Mexican squash with it's light green, thin edible skin and flesh that is lighter than zucchini. 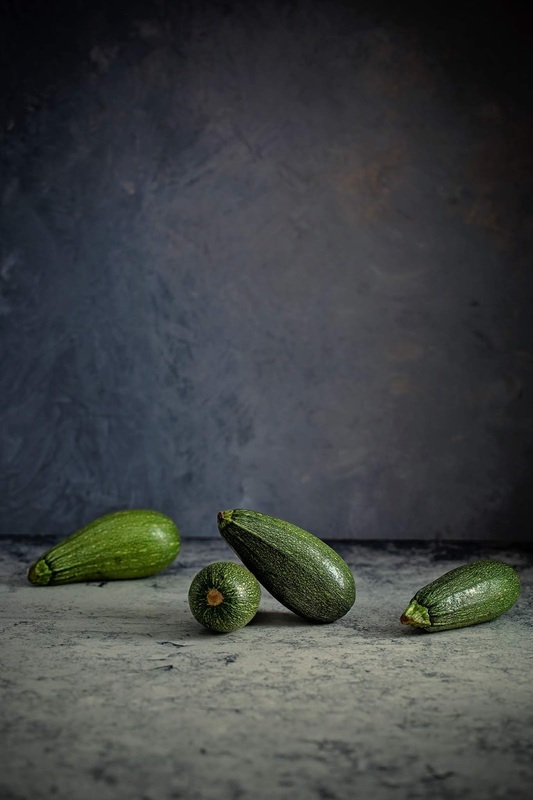 Mexican squash is virtually seedless and is ever so slightly sweeter than zucchini as well. Choose squash that are on the smaller side for the sweetest flesh, 4-6 inches in length. The dish starts with the gentle, slow sweating of diced onions. Once they're nice and translucent, in go the minced garlic and jalapeño. A few minutes later, the tomatoes get added, also diced the same size as the onions. This part requires patience and the success of the dish requires it: the tomatoes need time to break down, releasing their juices and creating the tasty broth that the veggies will swim in. This calls for a long, slow simmer on the lowest setting. A mere cup of water is added to help coax the vegetables to release their own juices. About 30 minutes later, the corn makes its appearance. Once it's heated through, in goes the squash for about 8 minutes, just long enough for it to get tender but still retain its firmness. At the end of the cooking time, the cubed panela gets mixed in and simmered long enough for the cheese to heat through. Panela is a non-melting soft, mild farmer's cheese that retains it's shape. 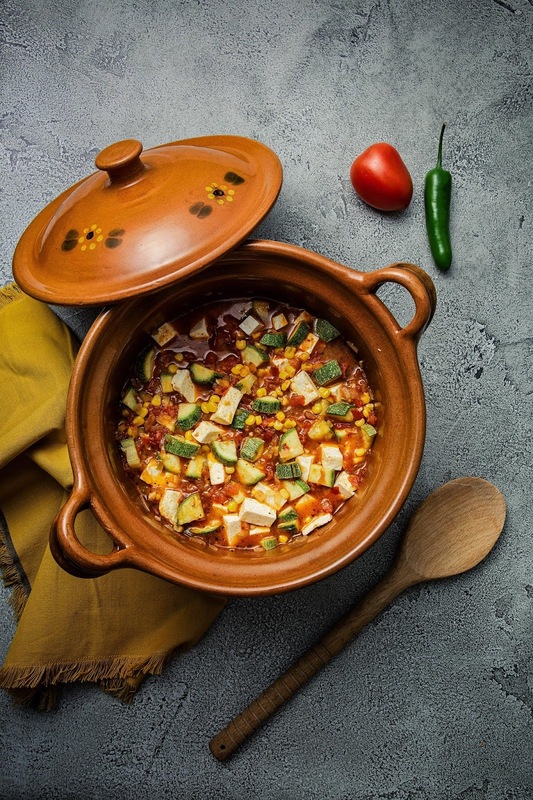 If you're familiar with Indian paneer, then you'll have a good idea of the taste and texture of panela. It's slightly sweet, creamy but firm and adds the perfect counterpoint to the acidity of the tomatoes and the spice of the jalapeño. In my mind, there is no more perfect dish. I hope you give it a try. Heat oil in a 4-5 quart dutch oven or soup pot with lid. Once shimmering, add the onions. Cook on medium-low until translucent, 6-8 minutes. Stir frequently so as to not get color. Toss in the garlic and the jalapeño, stirring for 1 minute or until fragrant. Add the tomatoes and all their juices and seeds, stir to incorporate; cover and allow to simmer for 10 minutes. Stir in the water and bouillon. Add the oregano by placing it between your palms and rubbing them together over the pot to crush the oregano leaves; this releases their natural oils and adds tons of flavor. Stir in the salt and pepper, cover and allow to simmer 20 minutes on the lowest setting. Mix in the squash, cover and cook for about 6-8 minutes, long enough to cook to tender but sill retain their shape and firmness. Add the cheese, stirring to heat through. Taste to adjust for salt, if needed. Serve as a main with some of the broth or use as a filling for tacos. Also delicious served over white rice. Until next week friends … ¡Buen Provecho!